At Eskenzi PR, we believe PR is more than simply achieving press coverage. It’s about staying current in the industry and shouting about news that really matters. By sharing with the world your company’s voice and achievements around various social networks, we help keep you relevant, topical and in tune with the daily news discussion. For our client FireMon, we send 3 stories in a twitter format (inclusive of hashtags and @’s) on topics relevant to the cybersecurity industry, which are then sent out periodically on the day from the company’s twitter channel. These can be tailored specific to the client’s own needs. We have also created a newsletter for FireMon to distribute internally which champions the week’s top coverage and the three top news stories from that week. This again helps increase overall viewership, shares of FireMon content and employee engagement. In addition, any FireMon coverage obtained will be shared across Twitter and LinkedIn from members of the Eskenzi FireMon team to increase circulation and potential viewership. 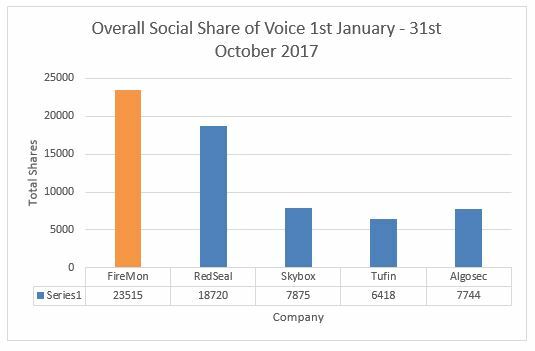 This helps boost FireMon’s overall Share of Voice which regularly pushes FireMon above their competitors. This is measured by our industry leading PR and social media analytics platform, TrendKite.